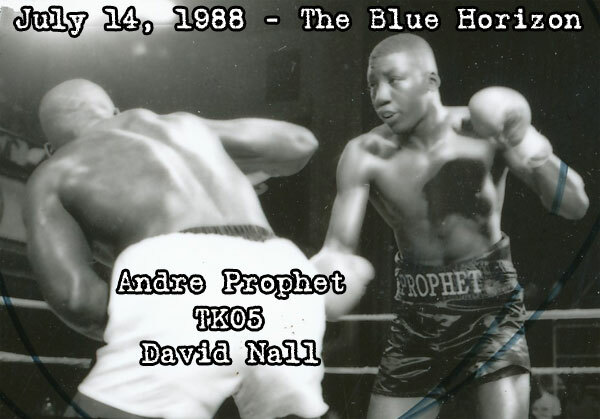 Surging cruiserweight prospect Andre Prophet scored a fifth round technical knockout over David Nall at the Blue Horizon on this day in 1988. The victory raised his promising record to 11-0-1 with 9 KOs. Nall, of Cleveland, lost for the first time in seven bouts. 1,003 paying fans came to see the main event that night - a ten round win by Hugh Kearney over David Taylor. But everyone came away talking about Prophet, who looked like he was destined for very big things. Prophet's manager Scott Kendall fully expected the twenty year old to grow into a heavyweight, and one day take on Mike Tyson. Prophet would be back in the Blue Horizon ring just two weeks later for another KO. However that fight would be his last. On August 13, 1988, Prophet tragically died in a motorcycle accident.